December is here and 2015 is soon coming to an end. As usual I’ll show you some photos from last month for «The Changing Seasons»-challenge. I didn’t shoot many photos in Oslo last month, but these are the highlights. Actually there’s only like 3 or 4 photos that didn’t pass my quality check this month, so what you see here is nearly all the photos that I took in Oslo this November (but I did shoot a lot in Bangkok, so it’s not like my cameras were collecting dust). Tall building and morning fog. Around December the 24th, I’ll post another post with photos from December 2015. I’ve also decided to keep this challenge going for another year (with some minor adjustments). Are you willing to keep it up for another year? I’d love to get your feedback on that. Meanwhile: enjoy the pre-holiday season! 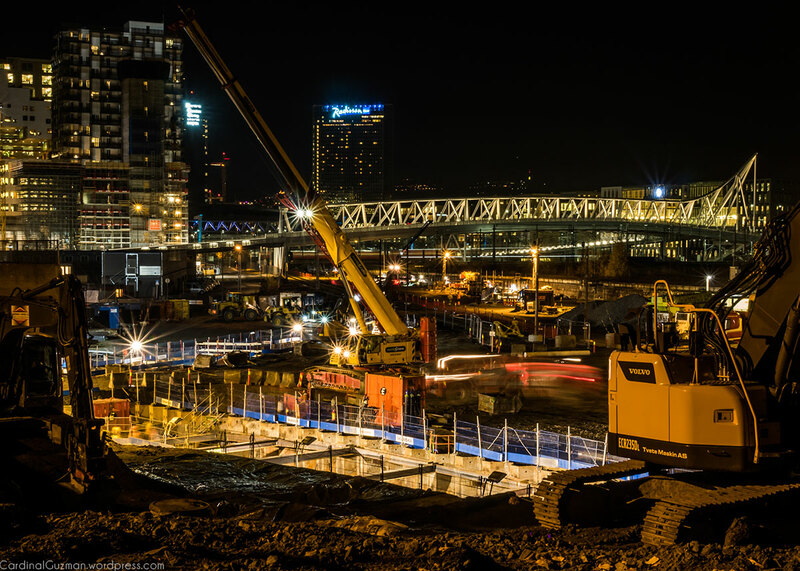 This entry was posted in Cityscape, Low-light photography, Night Shots and tagged #MonthlyPhotoChallenge, #TheChangingSeasons, cityscape, long exposure photography, long exposures, Night photography, nightscape, Oslo. Bookmark the permalink. I’ve very much enjoyed this, so I’m game for another go round 🙂 Like you, my December photos won’t be ready until a bit later in the month. Not much has changed since November, but I think there will be more to see towards the end of the month. This has been a lot of fun … and interesting. if you can do it, I can participate. Well, I’m definitely on board. Let’s hope for an easier year to come. The last few have been rough seas. Great golden photos! I am glad you want to keep the challenge going. Count me in. It was cold for a while: long enough for this pond to freeze so that I could go ice skating. The day after I went ice skating, the weather turned mild again and the ice melted… It’s not so cold here yet. On Sunday I was in my backyard, wearing a t-shirt while I was washing my bike (the temperature was around 3-4 celsius). 3-4 degrees…that to me is very cold and even with three layers on plus a jacket I’m shivering. Enjoy the “warm” weather, C. Doesn’t seem like you mind it at all. important thing – you cameras weren’t collecting dust ;-). those reflections are marvelous and I love the bridge. I enjoyed the challenge a lot, count me in for the next year. I would probably have to change location though. Courious to see what adjustments you have in mind. Thanks for the entry and the feedback and it’s great to hear that you’re in for another year! I really like the last photo with the foggy grayness wrapped around the street lamp and building. Thank you for hosting this photo challenge! I liked that foggy sight too: enough to stop, get my camera out and capture it. It’s definitely been interesting to keep this up on a monthly basis. Some months have been very easy, other have been difficult because of either lack of time, lack of inspiration or both. Like most people I’m more out & about during the summer, so the summer was easy to capture. The dark season has been more difficult. Gorgeous as always – love the winter light/ lack of. great…I will try to do a better job of doing this challenge next year…. It’s always good to keep pushing yourself. It has been an interesting year following you and others in the challenge as well as recording my locality. I now have a comprehensive photo blog of the seasonal changes and have been surprised at some of the findings. I am hoping for a hoar frost this month, but so far it has been too warm and wet. I have a post in draft, but will hang on a bit longer in case the frost appears! As for next year, well, I hope to move, so it might be possible to join in with a new location at some point! I’m also waiting for the frost. We had some, but it went away. I like the frost, because I can go ice skating, but in general I’m a fan of warmer temperatures (plus 30° is perfect). New locations are always interesting as a photographer, but with the new minor adjustments that I have in mind – it’ll be possible to participate in the challenge even for those who are never at the same spot, or those who change locations often for some reason. I won’t reveal more than this now, all the details will be online and official around the 24th this month. Sounds good. I shall see what I can do next year, this has been fun and also I have learned a lot from other photographers. Some great shots here. What the hell happened to 2015??? I know the feeling, I wish you all you wish for you and yours next year. And here’s some stuff for this month. I may do a another post later in the month if it snows. I hope it doesn’t, but that would certainly make everything look different! A very romantic and gorgeous gallery, Max. I am not able to participate still, but if you continue with your challenge next year I hope I’ll be able to take long enough walks to contribute. This has been a very eventful year for both of us. Maybe next one will be easier. Yes, let’s hope 2016 will be easier for the both of us! 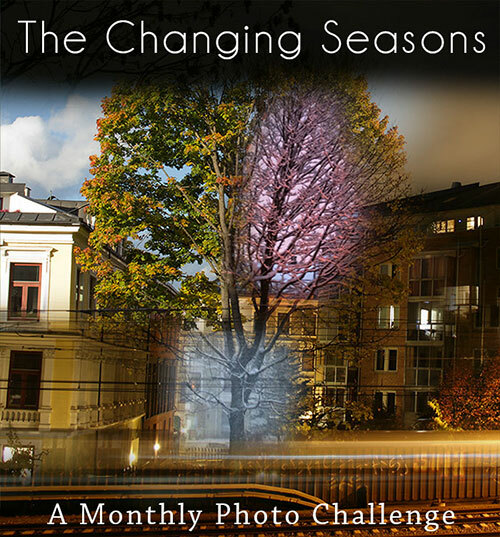 I can guarantee you that, with the changes I’ve done to it, you’ll be able to participate in The Changing Seasons 2016 Challenge. The night photos with lights and reflections are great! And I also like the last photo with the hazy atmosphere and fine contrasts. Thanks for the entry Mr. Townend. Like me, you clearly get a charge of being on the streets at night shooting. Yes, it’s without a doubt my favorite time of shooting. I hope you’ve had a great holiday. Happy new year! It’s late, but mine will be posted now, so I’m even later than you are! Happy new year Cecilia! I’m excited to see your posts in 2016. Happpy new year and thank you very much for participating. My wrap up will be posted now in a few minutes. I’d like another shot at it and this year I will choose a more versatile subject.